From starving stray to canine star, Ebbey portrays a wilderness search dog in the new film SEARCH DOG'S RAVEN: the Eerie Story of a Wilderness Search Dog Team. The upcoming action thriller is already receiving attention from the Hollywood Reporter and Variety magazine. Both the film and the animated spinoff are based on the real life adventures of a young woman and her wilderness search dog. Ebbey's character is the key to unlocking this film's unique twist. Not only does Ebbey have her own official web site, Ebbey.com, but she is the only Ebbey listed in the Internet Movie Database (IMDB.com). More about Rhodesians and their Ridgeback Quirks. Read this before getting one. Search Dog's Raven Silver and blue stylized Dog Logo Ebbey plays a search dog in the new film SEARCH DOG'S RAVEN: the Eerie Story of a Wilderness Search Dog Team. A black muzzled Rhodesian Ridgeback cross, Ebbey the canine actor, runs quickly along a path. Blurred Medium Close Up action photo. This clever mongrel's antics would wreak havoc for the average pet owner. However, Ebbey's naughty personality is perfect for the working dog lifestyle of a canine actor. Found starving in a garbage dump, Ebbey was adopted as an adult. She's one of several dogs rescued from an Aboriginal Reservation landfill, where feral dogs are regularly shot. 'Feral' refers to domesticated animals that have turned wild, and 'Rez' dog populations are often out of control since few if any are spayed or neutered. Most are undernourished and in various states of starvation. Relying on all their senses for survival, garbage dump dogs are great sniffers. The new film Search Dog's Raven needed to cast a friendly dog, who loves to sniff which made Ebbey a perfect choice. Unlike most garbage dump dogs, it was later discovered Ebbey had been spayed. Extensive efforts to find a previous owner hit several dead ends, so it's likely Ebbey was dumped. How long she was starving in a garbage dump or how many owners she's had in her short but turbulent life remains unknown. Director Allex Michael, who has now adopted Ebbey as her companion, says turbulent because Ebbey had bad nightmares for the first year. She also arrived with numerous scars. One scar could have been caused by barbed wire, and one fingertip sized scar looked an awful lot like a bullet hole. Several scabbed over wounds suggested attacks from larger dogs or coyotes. Ebbey also has a morbid fear of trains, stopping dead in her tracks and carefully listening when a train passes at night. 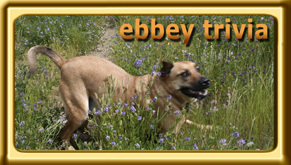 Owner Allex Michael: "I thought I was a pretty good dog trainer until meeting Ebbey. There may not be a more stubborn creature in existence. I almost gave up on her several times during the first six months." (Rhodesian Ridgebacks are known as 'independent thinkers' and not recommended for first time dog owners. Their self determination is likely why you don't see too many ridgebacks in films. 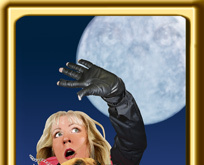 Make sure you also have the physical strength to control these clever and focussed dogs when they track a scent.) Ebbey is not a purebred ridgeback, but her behaviors are very similar. After being adopted, Ebbey lived up to her sweet disposition but arrived with a distinct set of 'behavioral baggage'. Behaviors suggesting this was not Ebbey's first adopted home. She has an intense dislike of barriers, crates or kennels. Despite walking reasonably well on a leash, Ebbey would suddenly whip around, yank her head out of a snug collar and take off. Escape instincts would also kick in when presented with any open door or gate. Her ultrahigh energy constantly got her into trouble (opening fridges and cupboards to steal food, chewing, digging indoors, clearing tables with her tail, destroying yard foliage, jumping six foot fences). Plus with an ultrahigh prey drive, chasing anything from wind blown leaves to deer, Ebbey likely got herself lost from several owners. Search Dog's Raven Silver and blue stylized Dog Logo Ebbey plays a search dog in the new film SEARCH DOG'S RAVEN: the Eerie Story of a Wilderness Search Dog Team. Ebbey in her t-shirt to prevent skin damage from scratching. After being adopted, Ebbey arrived with a distinct set of 'behavioral baggage'. Behaviors suggesting this was not Ebbey's first adopted home. 1. Despises barriers and kennels. 2. Walks well on a leash until she wants to go a different direction. Then Ebbey suddenly whips around, yanks her head out of a snug collar and takes off. 3. Open doors and gates trigger an escape. 4. Ultrahigh energy led to opening the fridge and cupboards to steal food, chewing, digging indoors, destroying yard foliage and jumping six foot fences. Like the stereotypical difficult child, Ebbey is used to getting in trouble. So the more you tell Ebbey not to do something, the more she does it. If you don't discipline her, she continues the behavior. But if she figures the discipline is too harsh, she'll run away or dig a hole right in front of you. Her ultra high prey drive, chasing anything from wind blown leaves to deer, also significantly increases her risks of becoming lost. Ebbey had eye discharge from the first day she arrived. She also vomited frequently. Within a few weeks, the poor critter would vomit up to seven times a day. Then wax began building up in her ears. About the third week, she began scratching and chewing herself. Ebbey's Owner Allex Michael: "I quickly altered several large t-shirts to prevent severe skin damage. Blaming it on a depressed immune system, none of the vets could identify the cause. Her bad behavior also worsened and she wouldn't sleep through the night. Which meant I didn't sleep." Allergies Are Worsening Behavioral Problems A black muzzled Rhodesian Ridgeback cross, Ebbey the canine actor overlooks a field. OVerhead photo. Ebbey's Owner Allex Michael: "I have some severe allergies. With similar symptoms, I began to wonder if Ebbey also had allergies. Allergies can make you miserable. In canines, allergic reactions can manifest themselves as self mutilation and increased behavioral problems. After some research on the internet, Ebbey's symptoms fit. Cleaning her ears several times a day, I drenched her itchy skin with cold tea, aloe vera, lavender oil (anti-bacteria) and calendula oil (healing) every hour. I also put her on a homemade elimination diet for food allergies, but it took over two months before there was any noticeable improvement. There also may have been lingering effects from starvation, as she had to be fed every four hours to prevent her from vomiting bile. This went on for over four months, with little improvement in her bad behavior. I was starting to become concerned because we had to begin filming soon." Search Dog's Raven Silver and blue stylized Dog Logo Ebbey plays a search dog in the new film SEARCH DOG'S RAVEN: the Eerie Story of a Wilderness Search Dog Team. Ebbey the canine actor resting on the carpet. Ebbey poses at the top of Alberta's Banff Gondola during production of the film 'Search Dog's Raven'. The August 2001 cover of Dogworld shows a purebred black muzzled Rhodesian Ridgeback. Though Ebbey's true ancestry remains unknown, her appearance and personality are very characteristic of this breed. What is she crossed with? Your guess is as good as ours. With her friendly disposition and allergies, she could be crossed with a yellow Labrador retriever. Knowing nothing about ridgebacks, owner Allex Michael did some quick research. Bred to hunt lions, ridgebacks are scent and sight hounds. The breed was developed from a semi-wild African dog (Ebbey's wild), bred with imported mastiffs (Ebbey's black muzzle), bloodhounds (Ebbey's intense tracking and loose throat), pointers (Ebbey points) and greyhounds (Ebbey's fast). Great danes and bulldogs may also have been in the mix. Search Dog's Raven Silver and blue stylized Dog Logo Ebbey plays a search dog in the new film SEARCH DOG'S RAVEN: the Eerie Story of a Wilderness Search Dog Team. Ebbey tracks a scent in a summer forest clearing. Even as pups, ridgebacks have the biting power of a German shepherd. They also have unusually sharp front teeth, even into adulthood, and Ebbey can skin a tennis ball in just a few minutes. This was of particular concern with the yellow furred 'Kong' dog toys in the film, but Ebbey hasn't skinned one yet. Ridgebacks are one of the few hunting breeds that will protect their master and property. Their renowned bravery shifts into autopilot during a crisis. As Ebbey gains more confidence in her permanent home, some of that Rhodesian ridgeback 'fearlessness' is showing itself. She now has a hate on for coyotes. Ebbey was found starving in a garbage dump and, based on her scars, likely suffered attacks by her wild canine cousins before being rescued from the wild. Search Dog's Raven Silver and blue stylized Dog Logo Ebbey plays a search dog in the new film SEARCH DOG'S RAVEN: the Eerie Story of a Wilderness Search Dog Team. Ebbey the canine actor looks into the camera while standing in a grassy meadow with tiny blue flowers Allex Michael: "Almost two years have now passed and, most of the time, I think of Ebbey as a really great dog. Considering where she started, and what's been done to her, this garbage dump dog has become exceptional. She's amazing on camera and I'll do my best to ensure she lives a long and healthy life".